UCF-FCI members Dr. Scott Hagen and Dr. Reed Noss are featured in a video called “Sea Level Rise: Facing the Issues.” This video provides a look at the many issues associated with sea level rise, with a focus on Florida. It was produced by UCF students Leah Reidenbach and Daniel Jones, with the assistance of Dr. Joshua Reece. This video comes with some helpful supplemental materials by Leah Reidenbach, Dr. Joshua Reece, and Dr. Reed Noss. These lesson plans, powerpoints, and other handouts are designed for high school classroom use. Teachers and students can download these materials, which are about the nature of science, what we know about climate change and sea level rise, and how science connects to public policy. The supplemental materials are available here. UCF-FCI member Dr. Linda Walters has created two activity books about sea level rise with former UCF student Sydney Katz. 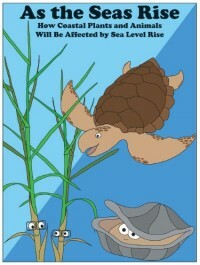 These books are written for kids in elementary school, and teach them about the coastal species that will be affected by sea level rise. You can download pdf files of these books by clicking on their covers below. “As the Seas Rise” is designed for younger children, grades 1-4. It introduces students to Lottie the Loggerhead Turtle, Marshall and Marsha Marshgrass, and Ollie the Eastern Oyster, and tells their stories with some easy and fun activities. 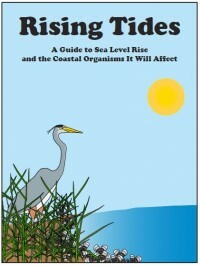 “Rising Tides” is intended for kids who are a bit older, grades 5-12. Lottie, Marsha, Marshall, and Ollie all return to teach about coastal ecology, life cycles, and the scientific research that is being done to understand how the coastal marsh ecosystem works. “We Will Remember Turtle Mound: Uncovering the Past and Saving the Future of Florida’s First People”is geared toward fourth graders. It tells the story of the Timucuan people and Turtle Mound, one of the largest coastal shell middens on the east coast. After describing the past, it tells about recent losses of artifacts due to climate change and “living shoreline” efforts to preserve and protect the midden into the future. Dr. Denise DeLorme and UCF students are working to promote ecologically responsible boating in the Mosquito Lagoon. Their campaign, called Reel Florida, aims to to raise awareness of the importance of protecting the valuable and sensitive marine life and habitats of Mosquito Lagoon. Learn more about their campaign and how to practice responsible boating on their Facebook page.